The Pamplona Bull Run, part of Pamplona's spectacular Fiesta de San Fermín, is an event that people tell their grandchildren about. Considered by some to be the definitive rite of manhood, the Pamplona Bull Run sees hundreds of intrepid locals and visitors risking their lives to outpace galloping, frenzied bulls as they hurtle along an 800-metre stretch of Pamplona's streets towards the bullring. The majority of revellers come to Pamplona for the encierro, or bull running - where people run along narrow town streets ahead of a herd of charging bulls. There are three parts to this 8am run, which vary in difficulty. 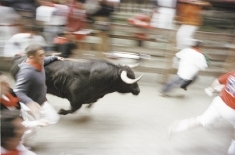 For those whose middle name is danger, Santo Domingo is a fast and furious bull running challenge. Even more dicey is the corner of Mercaderes. The rest should take on Estafeta, the easier part of this treacherous bull run. The Pamplona Bull Run was brought to international renown by a man whose name has become a synonym for machismo - Ernest Hemingway - and only the most intrepid diehards choose to run in front of the bulls. 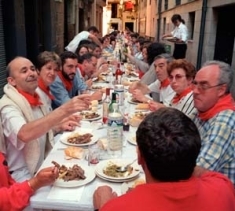 The Fiesta de San Fermín sees the city erupt into non-stop revelry in July and it doesn't return to its former sober self for some eight or nine days. The first bull-running take places on the morning of the 6th of July at 08:00 and then each successive morning up to and including the 14th. You should be ready an hour before the bull running starts, waiting for the rocket to go off to announce the start of the run. A good idea is to check out the route of the run so that you can choose the particular spot you want to start from. The length of the run is some 800 metres; the runners who gather at the bottom of Santo Domingo - the starting line - are crowded together as they sing a homily to the image of San Fermin. A rocket goes off at the moment the bulls are let out into the street. A second rocket goes off to let everyone know that all the bulls are now in the street. This is the moment of truth: it is impossible to race them or even keep up with them for very long. Each section of the run has its own particular characteristics so that many runners always choose to run the same section: In Santo Domingo the run is very fast and spectacular and risky at the corner of Mercaderes, while in Estafeta it is somewhat slower and clearer. The run into the bull-ring is exciting and colourful. Once the bulls have gone past the run has finished for you. When you hear a third rocket go off it is to let you know that all the bulls have arrived inside the ring and a fourth and final rocket is sent off when all the bulls have been safely led into their pens. Between that first rocket and final rocket only a couple of minutes will normally have gone by - but what a couple of minutes ! We are able to provide a selection of hotels in central Pamplona and offer transfers where necessary. Noáin airport is situated 7 kilometers outside Pamplona. We can fly you there in a private jet for one of the runs. Alternatively there are direct flights from London Stansted and connections into Pamplona from Madrid & Barcelona or flights to Biarritz or Bilbao.